The Boardman bike has a variety of features that make it unique and desirable; giving you a riding experience you will never forget. It has a lightweight triple buff frame made of aluminium that has an amazing strength to weight ratio, allowing for fast climbs and descents. It also features Continental Mountain King 26″ -2.2″ tires. The mountain bike also has a 120 mm Suntour Epicon air suspension fork with rebounding damping and lockout that is adjustable. The Boardman bike also features the SRAM X5 27 speed gearing offering its users a reliable and smooth gear shifting experience. The tire of the bike has Alex double wall rims with completely sealed bearing hubs that allow for tire longevity. Boardman mountain bikes allow you have an excellent off road experience, offering you a quality product for your money. Many customers that bought the Boardman MTB Comp noticed that the bike was a great value for the money. When riding the bike it was easy for them to see that they were riding a quality bike. Some reviewers that bought the bike loved how lightweight and yet strong the bike. Another common comment made among customers is that the suspension bike looks amazing and rides, well both on the road as well as off. Several people took long cross country bike rides and found out how smoothly the Boardman mountain bike made the trip. Not only was their ride smooth, but changing gears was also smooth and very quick. As with any product, there were a few negative comments made in regards to the Boardman Comp bike. One of the customers that bought the bike was concerned that one of the rear derailleur cable stuck out enough to catch his foot on. Another customer had an issue with the way the saddle felt. He easily remedied this by replacing the saddle with one that he felt was more comfortable. One other customer did not necessarily have an issue with the bike itself, but more with the way it was assembled before receiving it. Even though customers expressed some concerns a majority of them agreed that the Boardman bike was still an amazing bike and was well worth the money they spent on it. As with any product there are always going to be customers that feel there is something wrong with the product. However there are so many amazing features about this mountain bike that it is hard to not be interested in trying it out for yourself. With the bike you can go places that normal bikes will not allow you to go, while still feeling confident that you are riding on a quality product. Customers can rest assured that the Boardman mountain bike will last them for many years and through many rough rides. 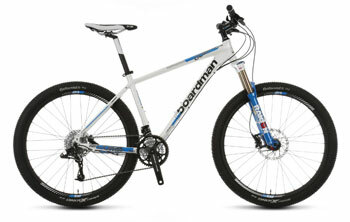 Find more reviews about the Boardman Mountain Bike Comp at Halfords here.